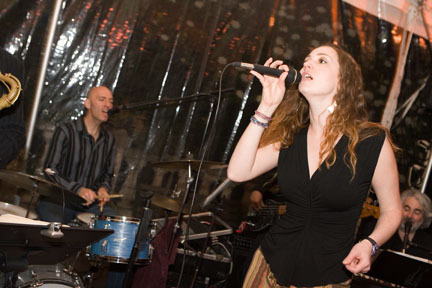 Nite-Time, New York Live Band for Weddings, Corporate Events, Private Parties. Nite-Time - New York City’s Premier Party Band! has been providing custom live music for weddings, corporate events, special events, private parties and more for over 10 years. This award winning band is comprised of seasoned professional musicians known throughout the industry for their high level of customer service and satisfaction. Nite-Time is fully committed to making your event a smash success. Whether it’s Motown, Funk, R&B, Jazz, Classic Rock, Disco, 80's, 90's or the current Top 40 dance songs that you love, Nite-Time will custom design the music you choose for your event, be it a wedding, corporate event, birthday party, holiday party, cocktail soiree, engagement party, bar/bat mitzvah or anything in between. Nite-Time is a dynamic and versatile group of full time professional musicians who came together several years ago with the collective vision of providing the best and highest possible level of live entertainment for events. Success! We have performed at hundreds of weddings, corporate events and private parties throughout the United States, delighting audiences with their energy and commitment to making absolutely certain that everyone has a good time at the party. Nite-Time and its members have shared the stage with artists such as Sheryl Crow, The Allman Brothers, Billy Joel, Gavin DeGraw, Blood Sweat and Tears, Bon Jovi, Darlene Love, Ashford and Simpson, Levon Helm and Ringo Starr. Click the links above to learn more about the number one choice for live wedding music and coporate event entertainment in NY, NJ, CT, the Hudson Valley, Tri-State area and beyond.